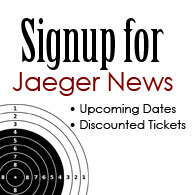 Welcome to Jaeger Arms Promotions online home. We pride ourselves in being Northeastern Pennsylvania's premier gun and knife show promoter. We present high grade gun and knife shows to the residents of Northeastern Pennsylvania. We thank you for visiting our website; please find a calendar of event as well as contact information from the menu items above. We look forward to seeing you at one of our events in the near future. It will be our pleasure to show you our fantastic selection of vendors and products.